Asus recently sent out media invitations for the unveiling of their next smartphone scheduled for October 16. Unlike most other companies that are secretive about upcoming events or like to drop subtle hints as to what will be released, Asus made it clear that their PadFone 2 will be the center of attention on the third Tuesday of next month. 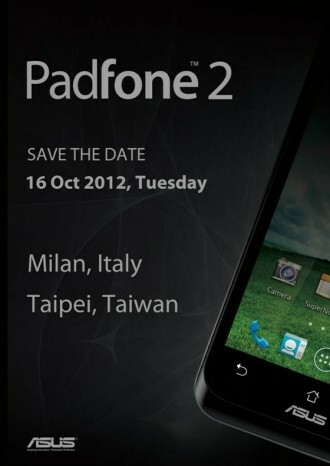 The PadFone 2 will be unveiled simultaneously in Taipei and Milan and aside from a partial photo of the phone on the announcement, not much else is known at this hour. Recently-leaked benchmarks indicate the phone will utilize a quad-core Snapdragon S4 processor but that’s all we have to go on right now. The original PadFone was similar in function to what Motorola attempted to do with the Atrix, a concept that was perhaps ahead of its time. As The Verge describes, the PadFone is a mobile phone that serves as the hub for all of your data. The interesting part, however, is the accessories that are available for it. The PadFone Station turns the phone into a tablet. A door at the back of the tablet opens up, allowing you to “install” the phone and use the larger tablet display. Everything on the tablet is powered by the phone – in fact, it doesn’t even work unless the handset is connected. It comes with a hybrid stylus / headset that allows you to make annotations on the tablet or even hold a conversation by talking through it. Furthermore, an optional keyboard dock that transforms the tablet / phone combo into a laptop.